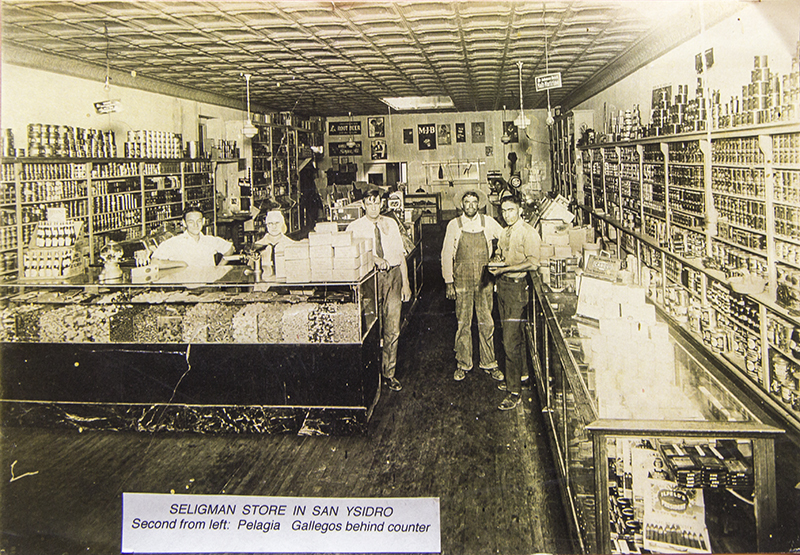 Seligman Store in San Ysidro. Second from left: Pelagia Gallegos behind counter. Used with permission from files of Sandoval County Historical Society. NOTE: The store closed in 1940. The location is now a vacant lot. San Ysidro was named for the patron saint of farmers, an 11th century Spanish saint, who is widely celebrated throughout New Mexico. He is depicted wearing blue trousers, red shirt and flat hat (a typical costume of pioneer farmers) with a plow and ox team, accompanied by an angel. The legend says the angel does his plowing while he is at prayer. San Ysidro has long been important on the route to points west. The trail that became Hwy. 550 connected Albuquerque and Santa Fe with Cuba and other Spanish villages to the west, and on to Chaco Canyon. A man from San Ysidro is said to have been the guide for the 1849 U.S. Army expedition to Navajo country. One result of their explorations was the first written description of Chaco Canyon (now Chaco Culture National Historic Park), and the guide is said to have named the major ruins, which explains the Spanish names we know today, e.g., Pueblo Bonito, Casa Rinconada. In the late 1800s, the Star Line Mail and Transportation Company operated with mule-drawn buckboard on a route from Santa Fe that crossed the Rio Grande at Peña Blanca and continued on to Arizona. San Ysidro also was on the supply route for forts in western New Mexico and was on the main stage line to Prescott, Arizona. What was initially State Highway 44, then renamed 550 was built in 1920 and paved in 1934. In 1924 a railroad line was built from Bernalillo with the intention to add two spurs from San Ysidro. The company went broke, and the rail line was abandoned in 1941. A post office was established in 1874. Today the town is less than half the size of the original grant. Again mirroring a scenario that was repeated throughout New Mexico, ownership was affected by political events beyond the control of the dusty little village. In the case of San Ysidro, villagers were paying taxes on their small plots but not the commons. In 1927, the San Ysidro Land Company was formed for the express purpose of acquiring the common lands by paying back taxes. Descendants of the original owners hired lawyers and successfully defended their land, but at a cost of $12,477.71 in return for a warranty deed awarded by the government in 1936. In 1938, under the Rural Resettlement Act, about half of the eastern part of the grant was purchased by the government for Zia Pueblo. A section of the western part became a grazing district under the jurisdiction of the Bureau of Land Management. San Ysidro Catholic Church, 2015. Photo by Judith Isaacs. Several historic buildings remain in San Ysidro. The Salon de Baile Historica (dance hall) was built in 1922. Some old-timers remember going by wagon to San Ysidro for the dances. 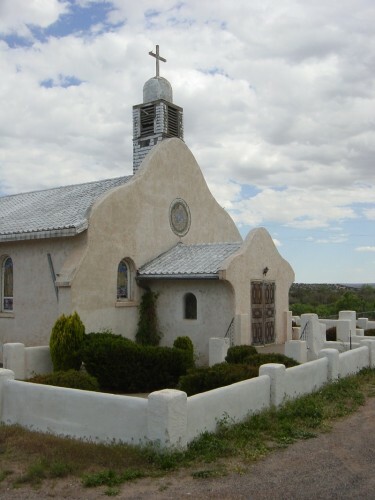 The present San Ysidro Catholic Church was built after World War II. It is one of four mission churches in the area, and mass is conducted every Saturday evening. 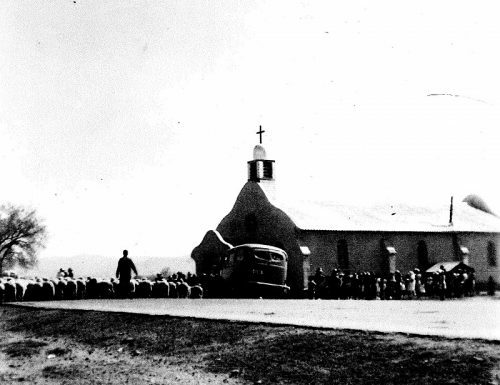 Sheep being herded past the San Ysidro Church and up into summer pasture in the 1940s. Photographer unknown. Photo courtesy of Henry Perea.